The Guardians origin issue, Marvel Super-Heroes #18, is fairly unassuming but sets the stage for the Marvel Universe of the year 3007. The Guardians that form come from all over the solar system, uniting diverse races from colonized Earth outposts before the Uncanny X-Men would pull the same trick in 1975 (except, you know, with actual women on the team). The story elements from Arnold Drake and Gene Colan’s 23 page origin would permeate the Guardians’ narrative through the 1990’s. Humanity is on the brink of extinction at the hands of the evil, reptilian alien-race of Badoon. Naturally, a fierce resistance is formed and triumphs long enough to draw breath: Earth shall overcome! As single issue origins go, the story is largely forgettable. Gene Colan’s character designs and layouts stand out more than anything, with an impossibly proportioned Charlie-27 reflecting Jupiter’s gravity, and the Badoon merging the coolest features of Skrulls, Triton, and Drowners (from the decades in the future Witcher). Drake and Colan’s work on Marvel Super-Heroes #18 also has the distinct claim of publication during Star Trek’s third season in 1969, a full 8 years before Star Wars: A New Hope. Guardians Team-Ups! Defenders, Avengers, Oh My! 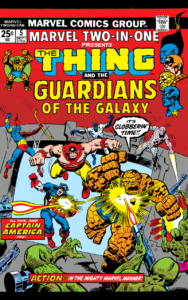 After their late sixties debut, the Guardians didn’t appear again until Marvel Two-In-One #5 in 1974, when Captain America, Sharon Carter, and the ever-lovin’ blue-eyed Thing travel to 3014 A.D. and enlist the aid of the Guardians. The integration of the Guardians of the Galaxy into Steve Gerber’s run on Defenders is where the Guardians really begin to blend into 70’s Marvel fare, with a preposterously stacked credits page on Giant-Size Defenders #5, including Chris Claremont and Marv Wolfman. Giant-Size Defenders #5 goes a long way to introducing the characters of the Guardians to a new audience, and giving more shape to the likes of Vance Astro and Charlie-27. The current Defenders roster of Dr. Strange, Valkyrie, Hulk, and Nighthawk allows for Dr. Strange to sense a disturbance in the time-stream, as the Guardians crash-land over 1,000 years in the past with the Badoon hot on their tail. At the end of the day, Defenders #26 to #29 are very much of the time period, reminiscent of series like Avengers vs. Defenders War, or Steve Englehardt’s Celestial Madonna story arc running through Avengers. It’s entertaining if you like Bronze Age Marvel, but for my money it doesn’t hold a candle to the Marvel Cosmic books Jim Starlin was putting out focused on Thanos and Adam Warlock around the same time period. 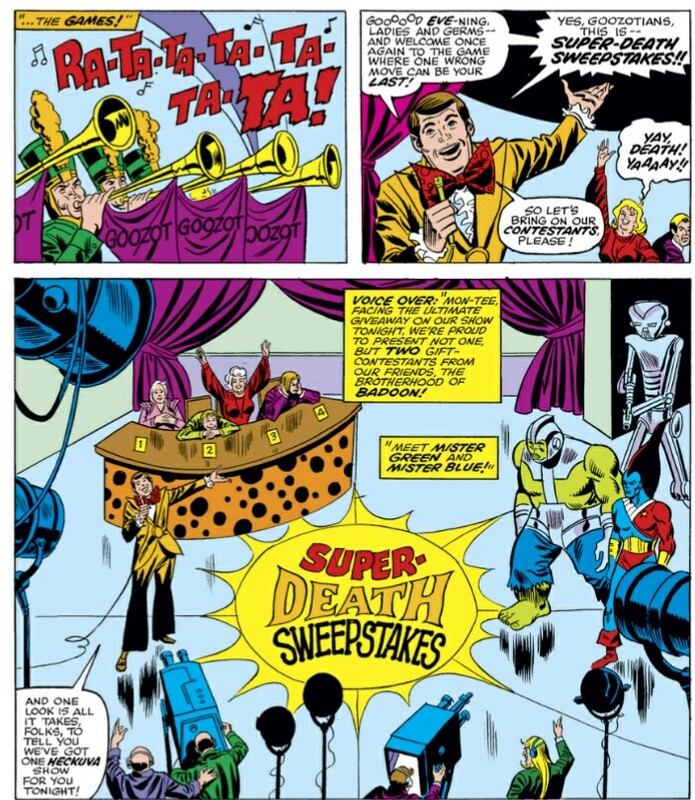 Gerber’s Defenders would get a heck of a lot weirder, but even in these early issues you can see him playing with the cosmic evolution of the Badoon (man alive did 70’s Marvel writers love a complicated alien evolution plot), as well as alien-race gameshows skewering our own entertainment in satire. Guardians of the Galaxy & Avengers in the Korvac Saga! Korvac Saga is unquestionably the most well-known Guardians of the Galaxy storyline prior to modern Marvel Cosmic in the 2000’s. The Guardians are more of curious cameos for the most part, with Korvac introduced in Thor Annual #6 and then running as an Avengers mega arc through 1977 and 1978. 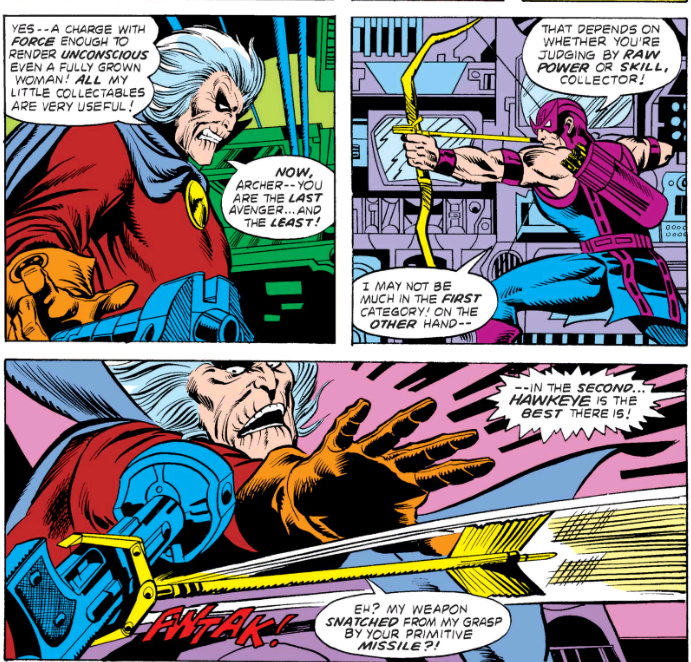 There’s all sorts of Avengers drama here from Jim Shooter and George Perez, but Guardians movie fans will likely find the most interesting developments in Avengers #175, with the Avengers captured by The Collector! In short, the Korvac Saga introduces one of the most all-powerful cosmic beings in the Marvel Universe, with the villainous Korvac transported from the era of the Guardians to present day. 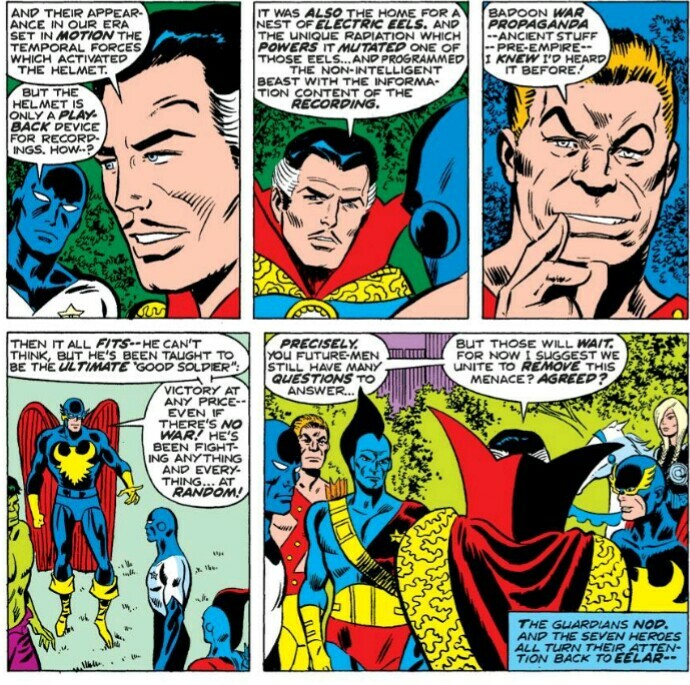 Since the scope of Korvac’s power is so immense, these issues also help explain some of the Marvel cosmic connections, such as the Elders of the Universe. Starhawk gets the most attention of any of the Guardians by a longshot, but this is recommended reading for any Avengers fans, and contains one of the best event-ending issues in Avengers #177! If you’re a fan of Bronze Age comics or Marvel history, it’s fascinating to return to this era of Marvel and see a very different Guardians of the Galaxy take shape. Personally, I was familiar with the Korvac saga, but got a lot more out of the Guardians cameos with the Defenders lead-ins under my belt. Unless Yondu is your favorite character from the Guardians of the MCU, the original Marvel Guardians of the Galaxy are going to feel like a completely different team (and they basically are!). Well, the now household franchise name Guardians of the Galaxy ain’t a bad start. Sure, Yondu’s the only member of Drake and Colan’s roster to make it into the MCU (yet! ), but conceptually the ragtag collection of disparate would be galactic heroes has passed the test of time. The Guardians of the 1990’s!